Very nice stag; did you harvested it in Slovenia during the rutting season? Interesting how the antlers are so similar to our Roosevelt Elk. Thanks guys. Yes it was taken in Slovenia by a client that I guided. It is one of 19 we got in 2 weeks rut time a week ago. It was a tricky stalk with last 50m belly crawling, shot at 280m with .300 Win. 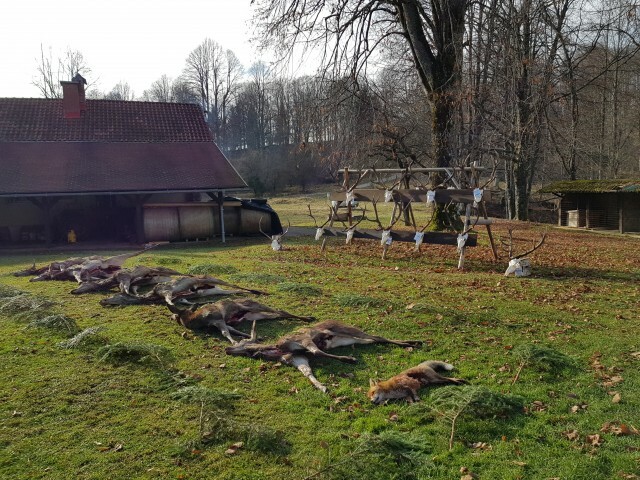 Thank you 93Mouse; 19 beasts harvested in a two-week time, you are on a mission to eradicate red stags from the Slovenian hills! Louis still 6 to go - full quota is 25 - all within numbers set by Ministry of environment (that are set at least 1/3rd too high to be sustainable IMO)...still the hard works beginns now the clients are gone - we (PH and 4 deputies) must cull 220 females and calves till the end of the year...with 40 lost during the winter that means at least 180. Anyway it is a great area full of reds (for the time being) - here is a pic after one of the morning hunts. Looks like you and your clients had a great season..congrats..
One of the great things about this site is the exposure to how things are done to manage game in various parts of the world, hunting regulations, etc. Yours are always interesting and informative. That's a fine looking dog!! What breed? I have been absent from the site for a long time but I need to give you a special thanks for helping me some years ago with my proposal to legalize blood tracking dogs in Idaho. It took about 2 years to get cleared and passed, but that proposal was approved and it has been legal to use a blood tracker since then! "The Germans were really meticulous in order not to lose any prey and developed a technique for which they bred resistant dogs with a great sense of smell, a strong bone structure, dropping ears and a steady temperament. These dogs were medium-sized and reliable. The Bavarian Mountain Dog was developed in the 19th century by crossbreeding specimens of the Hannoversche Schweißhund breed and hunting dogs from the Alps. The result was a hunting dog ideal for the work in the mountains. In 1912, the "Klub für Bayrische Gebirgsschweißhunde", (Club for Bavarian Mountain hound), was founded in Munich. Afterwards, this breed started gaining popularity in Austria and Hungary"
"The St. Hubert hound was, according to legend, first bred ca. 1000 AD by monks at the Saint-Hubert Monastery in Belgium; its likely origins are in France, home of many of modern hounds. It is held to be the ancestor of several other breeds, like the extinct Norman hound, and Saintongeois, and the modern Grand Bleu de Gascogne, Gascon Saintongeois, Ariegeois and Artois Normande, as well as the bloodhound. It has been suggested that it was a dog of mixed breeding, not at all uniform in type. 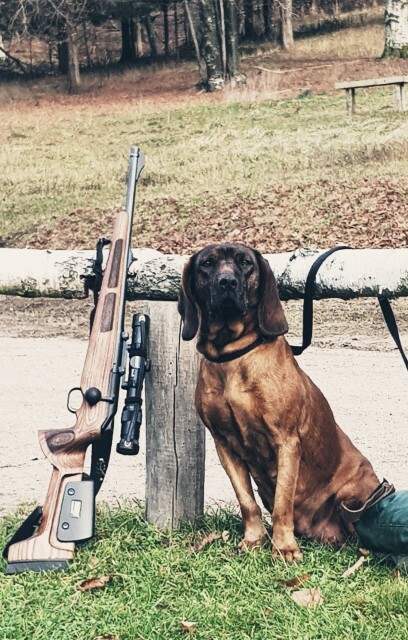 Writers on the bloodhound in the last two centuries generally agreed that the original St Hubert strain died out in the nineteenth century, and that the European St Hubert owes its present existence to the development of the Bloodhound." those St. Hubertus hounds were given not only to france by monks but all over europe and they are the grandfathers of the Hanover hound but this dog today is the result of only breeding the best of the best over centurys. Throughout most of its history the bloodhound was seen as a dog of English or Anglo-Scottish origin, either of unknown ancestry, or, more recently, as developed in part from the St. Hubert. It was only in the 19th century that it was claimed, primarily by Le Couteulx, to be the St Hubert itself. Medieval hunting pictures show raches and limers, of the general sagax type, with hanging ears and lips, but not having the specific characteristics of the bloodhound. 16th century descriptions of the St Hubert as short-legged, and only medium-sized have led to speculation that the main European antecedent of the bloodhound was rather the Norman hound, which was very large, than the St Hubert. Others such as the sleuth-hound, the Talbot, the dun-hound and the southern hound, as well as pack hounds, have also been supposed to have contributed to its make-up. Some writers doubt whether anything certain can be said about specific breed ancestry beyond the last few centuries. The picture given by Le Couteulx and D'Yauville of the St Hubert was that it changed considerably through mixed breeding, and perhaps degenerated, before its disappearance, while the bloodhound which replaced it, preserved its original character. However, it is apparent from 16th century pictures that the bloodhound itself has changed considerably. The modern St Hubert is the English bloodhound, in descent and type. Generally, national and regional variants of hounds, terriers, spaniels etc. have been recognised as separate breeds, France in particular having many regional breeds of hound; the bloodhound's identification as the St Hubert makes it an anomaly in this respect. 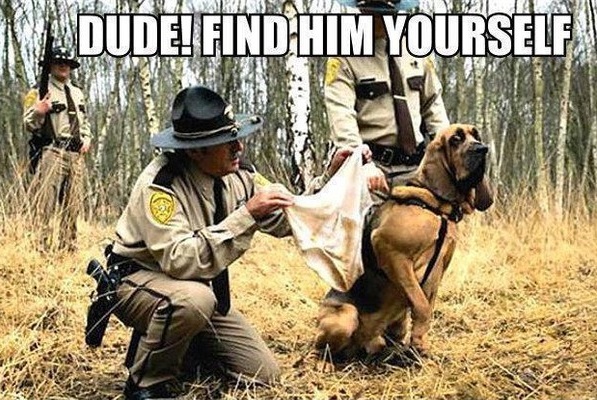 Whether the bloodhound is British or Belgian in origin is ultimately not something one can prove historically, depending as it does on whether one chooses to regard two related animals differing in tradition, and history, and somewhat in type, as separate breeds, or variants of the same one. " Thanks Ripp - it was indeed. The dog is Bayrischer Gebirgsschweißhund or BGS in short as Lancaster pointed out. Sadly they don't last - as some older members remember my old one - she passed away peacefully on Oct. 23rd 2016. On Tuesday she refused to eat on Friday she declined water on Sunday she was gone...Here is a pic of her, 2 days before going to the happy hunting ground. She was 16 years old and had a great hunting life. 93: Thanks for that. Very good stuff. And thanks to lancaster for the info on the dogs! Sorry to hear about your old one. 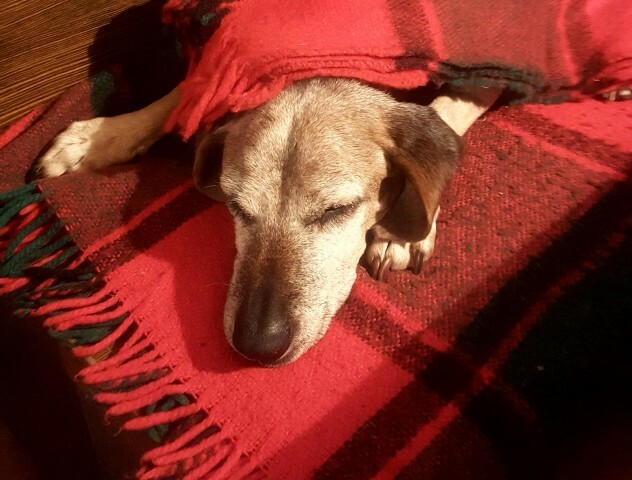 But she had quite the life of 16 years! Regarding your wolf population. You WILL see precipitous declines in game if you guys don't control them. The problem is, there is no way TO control that doesn't involve toxicants/poison I bet they won't let you use that. So your future is fewer head of game to hunt. Now, if you have few hunters and an abundance of game, then you may be OK. Here we have lots of hunters and in addition to wolves; coyotes, bear, bobcat and mountain lion that all kill a large amount of game either as fawns/calves or as adults. Our entire system of hunting has been turned upside down by wolves. By the way, is that a Blaser there with the dog? What caliber/scope? That is an ALL-business looking dog! Wonderful! 93: By the way, is that a Blaser there with the dog? What caliber/scope? Same old 9.3x62 with Docter 1-4x24 scope, sporting a new KKC stock. Nice BGS dog, good 9,3x62 working rifle and country with well established hunting traditions; you're a gifted man! "sporting a new KKC stock." Curious, what ammo do you use? Handload? 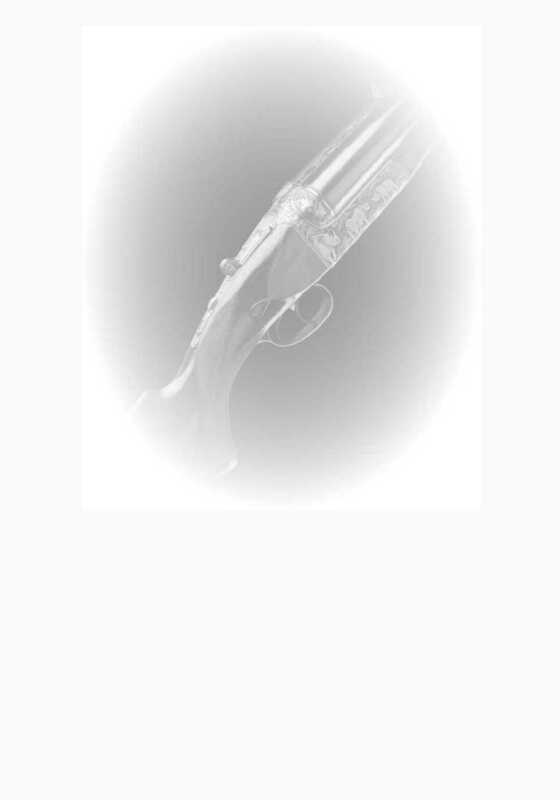 I've read those are good bullets but have no experience with them. I actually like the cheap Prvi Partizan 285 grain RN's. They are "soft" and work well for our deer and bear and elk. I've used them in both x57 and x62 9.3's. What is the make and rifle chambering of your drilling? 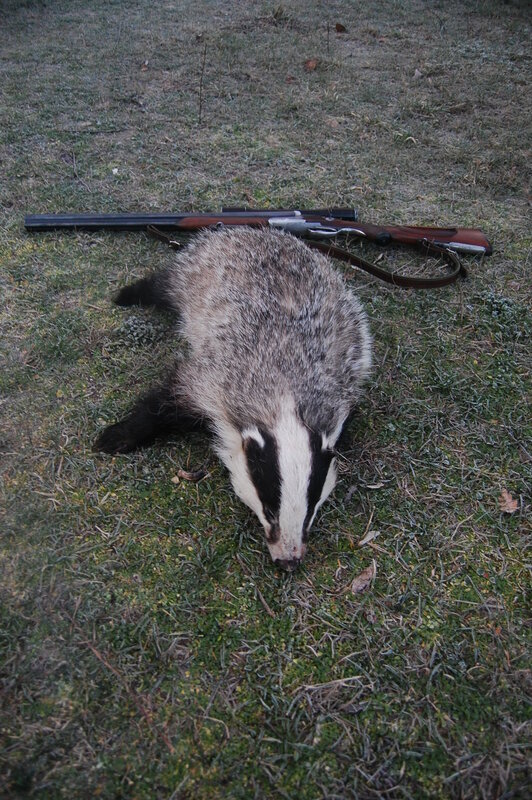 Congratulations on your nice badger, Lancaster; not many seen harvested on the Forum.